The North Texas Jewish community responded quickly in the aftermath of Hurricane Harvey, opening its arms, homes and pocketbooks to victims of the storm. With the storm hitting over Shabbat, most coordination began to take place Sunday as synagogues and Jewish organizations reached out to their respective communities and outlined ways to help and volunteer. The Jewish Federation of Greater Dallas is the central coordinating agency to raise money through the Hurricane Harvey Relief Fund, which can be accessed on the Federation home page, www.jewishdallas.org. One of the largest-scale efforts being funded through the Federation is the coordination of kosher meals through Dallas Kosher and its DK-approved caterers Lowell Michelson’s Simcha Kosher Catering, Howard Goldfeder’s Texas Kosher BBQ and Ceci Katz’s and Ruthy Henkin’s Taste of the World Catering. The process started when Houston Kashruth Association Executive Director Tzivia Weiss reached out to Dallas Kosher Kashrus Administrator Rabbi Sholey Klein and explained that Houston was out of kosher food. Not only were the stores closed, but also there was no kosher meat on the shelves. Rabbi Klein got creative and called Michelson and asked for help. Michelson responded with an enthusiastic yes. What began as preparing 500 meals for Shabbat has morphed into serving kosher meals to the Houston Jewish community for the next several weeks. Michelson’s team was busy Monday and Tuesday procuring food and preparing meals for Thursday night, Shabbat dinner and Shabbat day. Weekday meals will be served hot and Shabbat meals can be eaten at room temperature. The biggest logistical problem Tuesday was figuring out how to get the truck into the heart of Houston’s Jewish community, explained Michelson. On Tuesday, Michelson’s professional staff was busy cutting up chicken and vegetables. A kosher chef from New York was flying in to volunteer his services. On Wednesday, community volunteers planned to place items in foil pans and tape up and label them with the DK hechsher. The hope is that Michelson will head to Houston by noon Thursday. All meals will be served at the Robert M. Beren Academy, Houston’s Modern Orthodox Jewish day school near the Willow Meadows and Willowbend neighborhoods that were heavily damaged by the storm. Goldfeder will bring his BBQ rig down to Houston starting Sunday and cook on site through Wednesday. Following Goldfeder, the plan is for Taste of the World to come on board for next Thursday through Shabbat. Rabbi Klein explained that they are planning to provide food for three or four weeks including the Rosh Hashanah three-day holiday if necessary. By then, Houston’s kosher food pipeline may be back in business. “The meals will be provided at no cost to the Houston Jewish community. No one will be turned away and there will be plenty of food.” Klein said. “Let them come and get a hot, nutritious meal,” the rabbi said. “Everyone is welcome.” Klein said that they are planning on making 1,000 meals and will have plenty. Those interested in supporting the effort can donate to the Harvey Relief Fund at the Federation. All North Texas-area Chabads are also coordinating efforts with their counterparts on the ground in Houston. Area Chabads held meetings Tuesday night to coordinate their efforts. On Wednesday, Rabbi Dov Mandel of Fort Worth Chabad drove a 26-foot truck with six pallets of kosher chicken and meat and other supplies. The food will be delivered to Houston Chabad and then distributed to the 11 Chabads in the area to distribute to the Greater Jewish community in need. On Tuesday, Rabbi Menachem Block of Chabad of Plano arranged for 200 pounds of kosher meat to be delivered by Plano Chabad member Brian Honigbaum, who had to go assess damage in the area for another purpose. Rabbi Block had learned that all the Corpus Chabad’s meat had spoiled when the freezer went out there due to a power outage. Jewish Family Service began receiving supplies immediately and has been designated by the Red Cross as a “go-to” agency for people to get items and resources. JFS is collecting diapers, shampoo, conditioner, feminine hygiene items, soap, water bottles, gas cards, cards for groceries, canned food (and can openers), and utensils. Items can be dropped off at JFS, 5402 Arapaho Road, Dallas, TX 75248 between 9 a.m. and 5 p.m.
On Wednesday, the Aaron Family JCC became a drop-off point for supplies to be brought to the Houston JCC for distribution. Items requested are for moving boxes (flat), packing tape, gloves, cleaning supplies and non-perishable food. Initial plans are to begin sending the items to Houston by the end of the week. As the need for relocation becomes clear in the coming days, Jewish Family Service and the Federation are partnering to coordinate hosting and housing options for people who need it. By Tuesday, both of Texas’ Jewish camps had stepped in to assist Harvey’s victims and evacuees. Camp Young Judaea in Wimberley emailed parents and alumni Monday evening, three days into the storm, opening its doors to families that have evacuated Houston, about a three-hour drive away. Ten families were expected to arrive starting Tuesday, and more are anticipated once families are able to leave the flooded city, where the roads are closed. “As a camp director I have the opportunity every summer to create a community where campers and staffers live Jewishly at CYJ. We work hard to teach kids that they have the ability to change the world in their own way. In the wake of Harvey, CYJ has the opportunity to live our values and to use our resources to help the community. We hope that families who have been impacted will consider coming to our beautiful camp where we can provide food and housing and camp activities while they begin the difficult task of putting their lives back together,” CYJ Director Frank Silberlicht told the TJP on Tuesday. URJ’s Greene Family Camp in Bruceville also offered space for families to stay. But staff realized that families would be better served by an impromptu day camp for kids in Houston, freeing up their parents to go back home and survey property damage. As of Tuesday afternoon, the camp was looking for space at dry Jewish institutions in the area and aiming to open Thursday. Many synagogues and day schools are collecting supplies to be taken both to the Houston Jewish community and to evacuation shelters in Dallas. 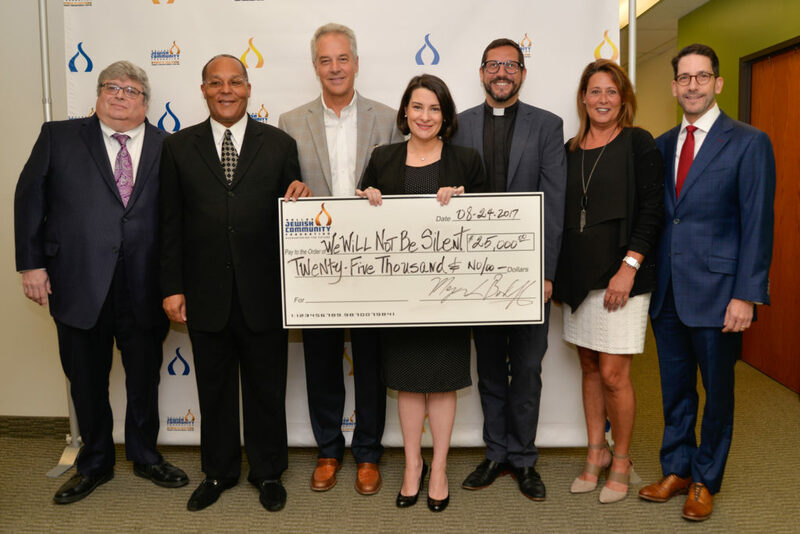 The Dallas Holocaust Museum, Anti-Defamation League, National Association for the Advancement of Colored People, Catholic Charities–Refugee and Resettlement Department and Cathedral of Hope United Church of Christ received $5,000 each. Along with representatives from each beneficiary, DJCF trustees Howard Cohen, Rusty Cooper (chairman of the board) and David Eisenberg were in attendance. Dignitaries attending were Holocaust survivor and Korean War veteran Max Glauben and his wife Frieda, as well as World War II veteran Leon Rubenstein. Mark Kreditor, the chairman of the board of the Jewish Federation of Greater Dallas, is also a scholar of American musical theater and the surprisingly extensive influence of Jewish cantorial modes on the great American song standards. Kreditor’s informational musical presentation “Jews, Pews and Blues” will be presented at the Temple Emanu-El Brotherhood meeting Sept. 6 in Linz Hall. The Brotherhood monthly board meeting is open to guests and visitors. The meeting kicks off with a buffet dinner at 6:15 p.m. and the meeting starts at 7 p.m. Dinner is $10 per person and you can reserve at tebrotherhood.com/guest. “Some 70 percent of the great standards of musical theater in 20th-century America were written by Jewish songwriters,” says Kreditor. “And many of those were the sons of cantors.” The specific cantorial modes of music (nusach in Hebrew, essentially meaning “flavor sounds”) generally parallel the messages of the Jewish prayers. “The yearning for a relationship with God in the prayers might be translated into the yearnings for a relationship with a girl or guy,” says Kreditor. “Love, fear, celebration can be translated musically with minor, diminished, major.” His presentation traces those origins with melodies familiar to generations of America. Kreditor is the grandson of a cantorial student from the Ukraine and he has been singing in synagogue since he was 8. As a student in Boston, he earned money by being a five-night-a-week “piano man” in local bars. It was then that he began to make the connections between the Jewish songwriters and the religion-based melodic flavors of their songs. In addition to running his own successful residential property management company and managing the affairs of the Federation, he finds time to create original musical compositions and take his musical presentations to synagogues, churches and other locations around the country, educating people about the Jewish writers who built the American songbook. In religious school we started the new year with an assignment to research over the course of the school year. We’re supposed to split up into groups and see which group can come up with the best explanation of the difference between the secular alphabet and the Hebrew alphabet. Some kids thought there’s no real difference, Hebrew just happens to be the ABCs of the Jews. Others, including us, disagreed and we feel there’s something special about Hebrew. We’re allowed to use any source, so we’re asking different rabbis what they think. Do you agree with the other kids or with us? I’m sure you’ll be happy to know that I strongly agree with you guys! Let’s try to understand what is the fundamental difference between the Hebrew alphabet and the ABCs or any other alphabet of any language, for that matter. This goes to the underlying difference between Hebrew, which is known as lashon hakodesh — meaning “the holy tongue” — and all other languages. English, as all secular languages, is made up of letters and words decided upon by man. There’s nothing inherent about a table, for example, that would cause it to be called a table; it’s just a word made up many years ago by people in England (from the old English tabule, which derives from the Latin tabula). They all agreed that a flat surface with four legs should be referred to as a table. In Germany they decided to call it a tisch and in Russia a stol. A group of kids in a class could decide one day to create a secret language and for them a gobbledygoop is a table, and voila, you have a language! Not only are the words arbitrary and chosen by convention, the letters that make up the words are man-made as well. It has very early sources, going back to a form of writing developed in Egypt nearly 4000 years ago and further developed by Phoenicians about 700 years later. As early as its sources, it was created by man. Lashon hakodesh, the Hebrew letters and language, is fundamentally different. The Hebrew letters and words were God’s building blocks of creation. The 22 sacred letters of the Hebrew alphabet are profound, primal spiritual forces. They are, in effect, the raw material of creation. When God combined them into words, phrases and commands, they brought about creation, translating His will into reality. There is a divine science in the Hebrew alphabet. The book Sefer Yetzirah, or Book of Creation, the early kabbalistic work ascribed to the patriarch Abraham, describes how the sacred Hebrew letters were used as the agency of creation. The letters can be combined in countless combinations by changing their order and interchanging letters in line with the rules of various kabbalistic letter systems. Each rearrangement of the same letters results in a new blend of the cosmic spiritual forces represented by the letters. An analogy of this can be found in the physical sciences. One combination of hydrogen and oxygen produces water, which another produces hydrogen peroxide. So it is with the infinite number of possible combinations of the atoms found in the periodic table of the elements. Not only do the Hebrew letters have creative powers, there are also lessons for life which the sages learn from the shape, order and direction each letter faces and appears in the Aleph-Bet. Just to take one example of many, the letter gimel faces the letter dalet. The word “gimel” has the same root as the word “gomel,” which means to give, bestow or donate. The best of Jewish cinema hits the big screens of Dallas next month when the annual Jewish Film Festival of Dallas, presented by the Jewish Community Center of Dallas and the City of Dallas’ Office of Cultural Affairs, opens. Eleven films of Jewish content, and many from Jewish writers and directors, will play to open audiences Sept. 7-27, almost all at the Studio Movie Grill at Spring Valley and Central Expressway. Tagged “like Sundance, only Jewsier,” the Film Festival, in its 21st year, is a celebration of film and entertainment, history and talent, all with Jewish flavor, fervor and fascination. The 2017 entrees, many with Israeli-Arab conflict and post-Holocaust themes, are topical. All foreign language films are screened with English subtitles and, with the exception of the opening-night The Origin of Violence, all films are appropriate for guests in high school and older. “We just lost Peter and it’s definitely difficult to think about welcoming audiences without him. He loved opening night and he’d always turn around after the start of the films to check out reactions, but I know he’ll always be in my heart. This year, as trying as it was, he’d come home and still screen the films,” said Brenda Marcus. With her husband Peter, who passed away in June, Brenda has chaired the event for the past eight years. The couple screened over 100 films each year, working with Rachelle Weiss Crane, the J’s director of Israel Engagement and Jewish Living and producer of the Festival, and event committee members Judy Borejdo, Andrew Cobert, Alexander Goldberg, Steve Krant, Catherine and Paul Lake, Ann and Steve Meyer, Haiya Naftalie, Gerri Patterson, Micole Pidgeon, Ted Rubin, Carole and Joram Wolanow, and Sissy Zoller. The festival is dedicated in Dr. Marcus’ memory, recognizing his great contributions. While he appreciated all of this year’s films, Fever at Dawn — which highlighted the courage of Holocaust survivors to embrace life and love — was at the top of his list, its romantic nature one with which he could identify. He was married to his beloved Brenda for 50 years; the two met as teens at Muizenberg’s Snake Pit Beach in South Africa and lived a fairytale life. Over 100 individual, family and corporate sponsors, as well as the Ackerman Center for Holocaust Studies at the University of Texas at Dallas, AJC Dallas, American Associates Ben-Gurion University of the Negev, Belmont Village Senior Living Turtle Creek, Bnai Zion, Congregation Anshai Torah, Congregation Beth Torah’s Chai Lights, Men’s Club and Sisterhood, Dallas Holocaust Museum/Center for Education and Tolerance, Dallas Jewish Historical Society, Jewish Federation of Greater Dallas, Legacy Senior Communities, Southern Methodist University, Temple Emanu-El, and the Jewish War Vets of US Dr. Harvey J. Bloom Post 256, join the Jewish Community Center of Dallas and the City of Dallas’ Office of Cultural Affairs to bring this year’s festival to the community. Talkbacks will be led by experts on many of the films’ themes. The Origin of Violence (French), with a talkback session led by Congregation Shearith Israel’s Rabbi Adam Roffman, is based on Fabrice Humbert’s semi-autobiographical novel. Nathan Fabre, a teacher in a French-German school working on his thesis about French resistance to the Nazis during World War II, discovers a photograph of a concentration camp prisoner who strikingly resembles his own father. Haunted by the image, he unsuccessfully asks his father for answers. Intent on discovering the truth, Nathan digs into his family history, complicating his relationship with a German woman whose family history is also unclear. The Women’s Balcony (Hebrew), with an evening and daytime matinee screening, is the story of a joyous celebration turned disaster when a women’s balcony at an Orthodox synagogue collapses during a bar mitzvah party, injuring a number of people and leaving the senior rabbi in a state of shock. When the younger and charismatic rabbi insists that the accident is a divine warning against female nonconformity, his fundamentalist ways soon divide the close-knit Sephardic congregation. Keep Quiet, with talkback led by Philip Aronoff, honorary consul for Hungary, follows the three-year journey of Csanád Szegedi, a former member of the Hungarian radical nationalist party Jobbik, who regularly espoused anti-Semitic rhetoric. When it’s revealed that his maternal grandparents were Jewish, he is guided by Rabbi Báruch Oberlander to embrace his newfound religion and forced to confront the painful truths of his family’s past, his own wrongdoing and the turbulent history of his country. 1945 (Hungarian), based on the acclaimed short story Homecoming by Gábor T. Szántó, tells of two Orthodox Jews arriving at the town’s train station with mysterious boxes labeled “fragrances.” The town clerk believes them to be heirs of deported Jews and expects them to demand back their property, lost during World War II, while others are afraid more survivors will come, posing a threat to the property and possessions claimed as their own. Dr. Nils Roemer, director of the Ackerman Center for Holocaust Studies, Stan and Barbara Rabin Professor in Holocaust Studies, will direct 1945’s talkback session. The Pickle Recipe (also with an evening and daytime showings) follows undisputed king of Detroit party MCs Joey Miller, whose prized sound equipment is destroyed; his own daughter’s simcha is upon the already in-debt single dad. Miller’s Uncle Morty offers to loan him the money — at a price: that he steal his grandmother’s treasured, and top secret, pickle recipe. Ben Gurion: Epilogue (Hebrew) will feature a talkback by Deborah Bergeron, director of the American Associates, Ben-Gurion University of the Negev, Greater Texas Region. Long-lost 1968 interview footage of an 82-year-old David Ben-Gurion, uncovered in the Steven Spielberg Jewish Film Archive in Jerusalem, allowed him a hindsight perspective on the Zionist enterprise. His introspective soul-searching and clear voice provide a surprising vision for today’s crucial decisions and the future of Israel. Fever at Dawn (Hungarian) is based on Peter Gardos’ novel of the same title. Having been freed from a concentration camp, 25-year-old Miklós is being treated at a Swedish hospital, diagnosed with a terminal disease. Dr. Sarah Abosch Jacobson, senior director of Education at the Dallas Holocaust Museum/Center for Education and Tolerance, will speak about the film and Miklós’ relationship of correspondence with Lili, one of 117 Hungarian girls he writes to, optimistic and hoping for marriage and a long life. Harmonia (Hebrew and Arabic), set inside a symphony hall, follows a childless Israeli musical couple seeking to form a family, and a musician of French-Arab descent from East Jerusalem, in this contemporary adaptation of the tale of Abraham and Sarah. A talkback with Fred Nathan, retired head of school, Ann and Nate Levine Academy, will follow the story of how two rival prodigies are born, one Jewish and one Arab, leading to a clash of cultures reconciled only through music. Past Life (Hebrew, English, German and Polish) is a hybrid thriller and emotional melodrama of sisters: a combative liberal journalist Nana and her sister Sephi, a soprano and aspiring composer. Sephi is accosted by an elderly Polish woman, angrily accusing the girls’ father of murder. Traumatized by the encounter, the sisters launch an investigation, attempting to discover what really happened to their father in Poland during the war. Rabbi Sheldon Zimmerman, returning to Dallas as an adjunct lecturer in SMU’s Jewish Studies Program, will provide the post-screening conversation. Joe’s Violin (the last with evening and daytime options) provides the improbable relationship between 91-year-old Holocaust survivor Joe Feingold and 12-year-old Brianna Perez from the Bronx, brought together by a donated musical instrument, proving the power of music, and acts of kindness, in the darkest of times. Fanny’s Journey, based on an autobiographical novel by Fanny Ben-Ami, is a suspenseful and poignant coming-of-age drama. Following the arrest of their father in Paris, Fanny and her younger sisters Erika and Georgette are sent to a boarding school in France’s neutral zone, only temporarily as the Jewish students were then sent to another institution under the care of the tough, but tender, Madame Forman. The children’s fate is entrusted to young Fanny, who fearlessly treks through the countryside on a perilous mission to reach the Swiss border. Dr. Zsuzsanna Ozsvath, Leah and Paul Lewis Chair of Holocaust Studies at UTD’s Ackerman Center for Holocaust Studies, is this film’s talkback leader. Additional details, film trailers, and ticket sales are available at bit.ly/2xy5OpQ. Advance tickets (also available at the JCC) are $13 ($10/student with ID) and $16 at the door. We can never discount the mind’s ability to make pictures even better than the ones we saw on movie screens during kids’ matinees decades back. So ever since I bought the old car I’m still driving now, I’ve had my standard dashboard presets. FM: KERA and WRR for brain stimulation and classical music; AM: KRLD and KAAM provide news and the pop songs of the ’40s, ’50s, and not much beyond. However, I had a recent rude awakening, fueled by current chaos in our country’s government. I drive a lot, and the news being what it is — almost always a surprise! — I’ve stayed with KRLD virtually all the time. But the other day, I tuned to KAAM for some respite, and found an even bigger surprise: No longer a music station, it has become Christian radio! Completely! I confess total fascination, despite the warning I received a long time ago from an Orthodox well-wisher who disapproved of my ongoing efforts to meet with and learn from evangelicals: “Why are you wasting your time and messing up your mind with that stuff?” I’m still on the mailing list of some “Messianic Jews,” who — annoying as they are — continue to educate me. But now, at the touch of a button, I can find my own education on what’s current with right-wing Christians. However, in listening to KAAM more than KRLD as I “vacation” from daily politics, I’ve already had two major lightbulbs pop up over my head. The first: I heard an evangelical minister state, quite definitely, that he does not approve of, nor believe in, Messianic Judaism and organizations like Jews for Jesus! Yes! Really! Christians are supposed to evangelize, but not muddy the religious waters with half-beliefs. His bible says one cannot serve both God and Mammon, which he defined as money when it becomes a false object of worship. Ours specifies the non-worship of any but the One God, so no one should be trying to engineer some kind of hybrid faith that is true to neither Christianity nor Judaism. Hooray for him! The second is fascinating, but a bit strange: Another minister believes that we — the Jews of our current generation — will soon be rebuilding the Third Temple in Jerusalem! Yes! In our own time! He says a group of us (he doesn’t divulge who’s in it) has already put together the Biblical plans with a stockpile of all the original holy accoutrements, and everything is now in readiness for construction! He’s enthusiastic; after all, the alt-right Christians need us to fulfill their New Testament prophecies. And this man sounds to me like a would-be prophet himself. So there’s my new “music!” I’ll continue to follow KRLD for news, but occasionally I’ll switch over to KAAM to hear Christian financial advisors, a variety of question-and-answer shows, some Biblical quotes, some prayers, even some hymns. As a teacher and camp director who has worked with children and families for many years, one of the biggest changes (and most worrisome) is seeing children with a sense of entitlement — “It’s all about me!” Judaism has a lot to say about this and, as we enter the New Year, it would be good for all of us to remember the lessons of our sages. One wonderful way to teach this is to share this message from the rabbis: We should always carry two pieces of paper in our pockets. In one, the message is “For me the world was created!” And the other is, “I am but dust and ashes.” There must always be balance. A good exercise is to write down the values or qualities that you hold important and then try to narrow down the list until you have your top three (or maybe top 10). Is being humble on your list? How about being grateful or thankful? How has our society created the “me-generation” and how do we get back to balance? We do want our children to know that they are unique and special (especially to us) but along with that comes responsibility. I have just discovered a new children’s book: Only One You by Linda Kranz. This is a book that I now add to my list of gifts to special people in my life of all ages. The book is simple and beautiful, with wisdom throughout from a mother and father fish to their young child heading out to the world. The final lesson is so Jewish, it could have been written by a sage from the past or present: There’s only one you in this great big world — make it a better place! As we enter the New Year, let us remember that we are part of the world, yet unique is what we have to share, and we have the obligation and opportunity to make the world a better place — tikkun olam! The recent anti-Semitic rants of torch-bearing Nazis and KKKs, marching in Charlottesville, Virginia, and the tragic events which followed, were vivid reminders that racial and religious hatred is still a challenge to the American ideals of liberty and equality. In the same week, somewhat hidden in the “back pages” of the news, was the announcement that the first comprehensive digital archive of Jews who fought in the Civil War, known as The Shapell Roster, is expected to be completed and made public by 2018. This story has its beginnings in the increased anti-Semitism of the 1880s due to the large numbers of eastern Europeans escaping from the devastating pogroms of Russia, many finding refuge in the United States. Resentment of newcomers is an old story. In December 1891, an anti-Semitic article appeared in The North American Review, a new literary publication, which stated that Jews generally tried to avoid serving in the military. This was followed by a letter from a Civil War veteran who claimed he never knew of any Jewish soldiers nor any other soldiers who knew of any Jews in the Union army. Since a bounty system was in place, allowing draftees in the Union Army to pay a bounty to someone to take their place, the implication was that Jews paid bounties and never served. Nothing could be further from the truth, and many Jewish veterans let their objections be known to The Review. A small group of Jewish Union and Confederate Civil War veterans met to form an organization which pledged to stand up to the anti-Semites. Known today as The Jewish War Veterans of the U.S.A., they are the oldest continuous veterans organization. Simon Wolf, a Jewish attorney, diplomat, and active benefactor to Jewish charitable causes, saw the North American Review’s anti-Semitic article as an opportunity to show that Jewish Americans have served as patriots, soldiers and citizens throughout its history. It took Wolf almost four years (1895) to compile government personnel records totaling 10,000 Jewish names, 7,000 from the North and 3,000 from the South. In addition, he included the Jewish soldiers’ and sailors’ contributions in the American Revolution, the War of 1812, and the War With Mexico. Here are some interesting facts involving Jewish soldiers on both sides during the Civil War. President Lincoln awarded seven Medals of Honor to Jewish soldiers. This is the highest award that can be issued to a member of the military. There were various Jewish families of brothers who served: six Cohens of North Carolina, five brothers of Jonas (four Confederate, one Union) from Mississippi and other family groups of Moses, Goldsmith, Levy, Wenk, Feder, Emanuel and Koch, etc. Also included in Simon Wolf’s findings of Jewish Civil War veterans are names of 24 Union staff officers, 24 Confederate staff officers, 11 Confederate Navy officers and over 300 pages alphabetically listing names of thousands of Jewish soldiers from both armies, classified according to states. After completing the 576-page account of the Jewish population’s contribution to America’s military, Simon Wolf sent a copy to Mark Twain, who had previously questioned the amount of Jewish support given during the Civil War. After examining Wolf’s book, Twain reversed his position, stating that the numbers show a even greater ratio of participants than the non-Jewish population. Twain apologized for his ignorance. Additional records of Jewish Civil War personnel not made available to Simon Wolf have since been uncovered by the Roster Project and will be added to his original list of Jewish military personnel. The additional discovery of Jewish soldiers’ artifacts such as ketubahs and letters to Jewish mothers should bring even greater excitement to this future online Civil War exhibit, due to be available in 2018. Trusts & Estates magazine has announced the winners of its 2017 Distinguished Author awards. Marvin E. Blum, JD, CPA, has been named the winner of the Trusts & Estates 2017 Distinguished Author award in the Thought Leadership category. Blum will be honored at the WealthManagement.com 2017 Executive Forum and Industry Awards gala being held Oct. 11 at the Plaza Hotel in New York City. The Wealth Management.com Industry Awards recognize outstanding achievement in the wealth management industry. Blum was nominated for his article Filling in the Gaps: Create a Red File to Cover Issues Beyond Traditional Estate Planning. The article suggests supplementing a traditional estate plan with a “Red File” — a centralized file of important information and documents, a clear expression of financial intentions, and guidance for care should one become incapacitated. Blum is a nationally recognized estate planning expert known for creating customized, cutting-edge estate plans. His firm, The Blum Firm, P.C., has offices throughout Texas and has grown to be the largest group of estate planning attorneys in the state. Isadore Garsek Lodge of B’nai B’rith will honor the 2017 Jewish Person of the Year at an award dinner at 6:30 p.m. Sunday, Oct. 22, at Beth-El Congregation in Fort Worth. State Representative Craig Goldman will be the keynote speaker. Cost of the evening is $25 and will include a delicious barbecue dinner catered by Riscky’s. Kosher meals will be available with advance notification. The lodge is currently accepting nominations for the Jewish Person of the Year. Send your nomination to Isadore Garsek Lodge, 4420 W. Vickery Blvd., Fort Worth, TX 76107. For reservations or tickets, contact Rich Hollander at rich.d.hollander@gmail.com or 817-909-4354, Alex Nason at alexnason@charter.net or Marvin Beleck at marvinbeleck@aol.com. The Fort Worth Federation of Temple Youth (FWFTY) kicked off the 2017-18 year with a trip to watch the Texas Rangers play the Houston Astros. In between rain showers, we watched a celebration for Pudge Rodriguez, who was inducted into the Baseball Hall of Fame. His No. 7 jersey was retired. If your ninth- to 12th-grader is interested in joining FWFTY, please contact Lance Friedensohn at friedensohn@gmail.com. Displaced families from the Willow Meadows subdivision are in the process of taking up shelter on the campus of Robert M. Beren Academy. School officials were working with police and neighborhood volunteers to open the school on Monday morning, Aug. 28. “There are 10 families, possibly more, who want to go,” said Jenelle Garner, who is helping coordinate the move, after most of the Willow Meadows subdivision near Brays Bayou in Southwest Houston suffered heavy flooding from Hurricane Harvey. Continue reading this story on the JHV website. Houston’s Jewish community is assessing its damages after large portions of Harris County and surrounding counties were engulfed by floodwaters a day-and-a-half after Hurricane Harvey struck the Texas Gulf Coast. During a conference call with community leaders on Sunday afternoon, Aug. 27, the local office of Jewish Family Service reported that it initially received communications that some 150 neighborhood blocks, where Jewish community members live, suffered flood damage from the storm. Houstonians near Brays Bayou in Southwest Houston have been stranded for several hours Sunday, Aug. 27, waiting for rescue crews as floodwaters continue to climb a day-and-half after Hurricane Harvey made landfall on the Texas Gulf Coast. Robin and Kevin Alter and their two teenage children told the JHV that over the course of four-plus hours, they’ve watched as many as seven rescue boats and jet skies pass by their flooded home on North Braeswood Boulevard near South Rice Avenue. “They keep saying they know about us and they’ll be back for us,” Robin told the JHV by cell phone at around 12:30 p.m.
Several rescues were performed in the Willow Meadows subdivision during the early hours of Sunday, Aug. 27, as Houston suffered catastrophic flooding a day after Hurricane Harvey made landfall along the Texas Gulf Coast. According to early reports, unprecedented levels of flooding are widespread throughout the city and county. Local residents have become first responders. Members of the Hebrew Order of David are going door-to-door in flood-damaged neighborhoods along Brays Bayou, rescuing stranded residents and bringing them to safety, as Hurricane Harvey continues to pummel the Texas Gulf Coast with record-setting rainfall. Vincent Wedelich managed to ride his bike into a flooded area near North Braeswood Boulevard and Hilcroft Avenue on Sunday evening, Aug. 27, after receiving an HOD text message that a mother and daughter needed help. 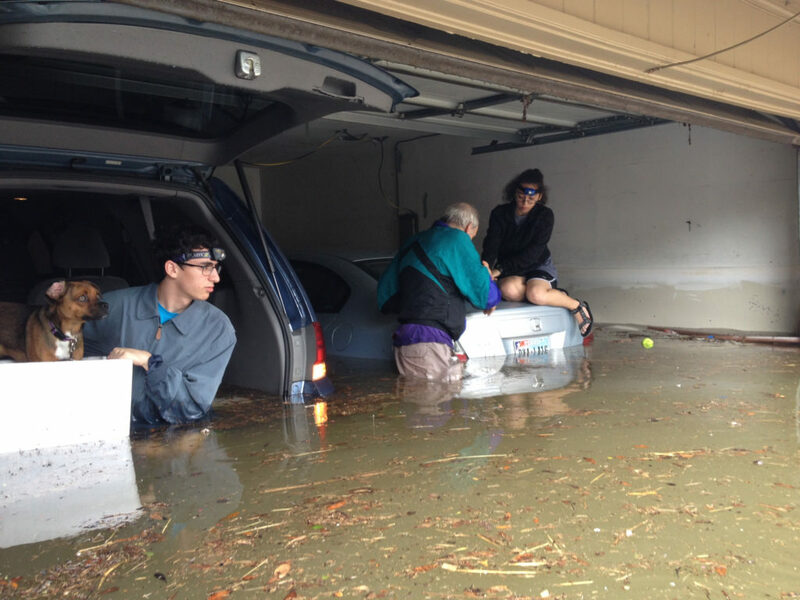 The homeowner, Amy Goldstein and her 14-year-old daughter, had been waiting some 12 hours to be rescued from their flooded home on Cheltenham Drive when Wedelich arrived. I was in Israel recently and many Israelis asked, “Why do your American Jewish leaders care so much about the Wall; it’s only bricks and cement and not even part of the original Temple? I did not have a good answer; I saw the problems he spoke about but had no response. Any insights on this? Thanks for your feedback and your painful but crucial question. I will add an additional question; why does the heterodox Jewish leadership desire to hold prayers at the Wall? Keeping things in context, the Wall was the outer structure which surrounded the Temple courtyard, a protective wall for the service performed in the Temple. What was the Temple worship? Animal sacrifice! Whether a sin-offering, a peace-offering or any of a diverse protocol of offerings, the main focus of the Temple worship was animal sacrifice. Furthermore, this worship was entirely carried out by males, the Cohanim or priests. Although a female was allowed to bring an offering and at times was obligated to, the actual service was conducted by males only. This is all explicit throughout the Book of Leviticus and the oral tradition. Jews have prayed fervently for the past 2,000 years for the rebuilding of the Temple, for which the Wall stands, for the return of precisely that worship which we mention. This is explicit in the words of the traditional daily prayer service, the Siddur, in numerous prayers. These concepts are anathema to heterodox Jewish doctrine. The very idea of animal sacrifice is abhorred and relegated to primitive, barbaric cultures. (The deeper, true meaning of this service would take another column.) Furthermore, it’s a completely male-dominated service. Lastly, we derive the tradition of praying with a mechitzah, a separation between men and women, from the Temple service (Talmud Sukkah 51b). Being that the Wall stands for all this, I find it hard to understand why the heterodox leadership would want to pray there. Furthermore, the ability to pray as one wishes at such a spot should certainly not be higher on the agenda than the physical and emotional welfare of the Israeli poor. To claim that the Wall no longer represents the Temple service and is nothing more than a popular public square is simply not being intellectually honest. I challenge the many American Jews who have been less than punctilious in their synagogue attendance to explain why they find it so crucial to pray “their way,” or any way, at the Wall? Is this truly stemming from a deep spiritual desire to connect to their Creator? Or, perhaps, does the fact that they are not allowed to pray their way at this holy site suggest that their way is inferior to the traditional service, something they are not willing to give a pass to? This, sadly, would be a political, not spiritual, motivation. When an argument becomes political and personal, it has the potential of taking precedence even over those things one considers most dear, such as welfare of the poor and the like. I challenge the leadership threatening to make their support of Israel contingent upon their ability to pray as they like at the Wall to honestly consider these points. Lastly, I would like to believe that, deep down, this battle is emanating from the purity of the Jewish soul — that which Jews have referred to for millennia as the pintela Yid, the spark of holiness in a Jew. We all, regardless of our background or affiliation, in the recesses of our soul identify with the Wall and all that it represents. We all are trying to find a way to make it our own and connect with it. Perhaps we would be well to learn from the well-known adage, “When you’re in Rome, do as the Romans do.” When you’re at the Temple, do as the Jews did at the Temple! We all have our synagogues and temples to pray in, as we wish, throughout the world. Perhaps we can find it within ourselves to have one place in the entire world where we can just forget everything else and all be the same; embrace each other at the same service, with the highest common denominator so that nobody will be excluded; join together in the spirit of brotherly love and peace. Perhaps, just maybe, if we do so we will be rewarded from Above with the final building of the Temple and the ingathering of our exiles for all time.